This page tells of the art conservation efforts to save the gorgeous 13 murals on downtown Los Angeles freeways that were commissioned for the 1984 Olympic Arts Festival. 10 living master muralists, commissioned for the 1984 Olympic Arts Festival, painted the the 1984 Olympics murals series that adorned Downtown LA freeways with 13 monumental fabulous murals. The smallest of these murals is 15 feet high and 45 feet wide. The largest is 23 feet high and 300 feet long!! Since their placement on the freeways, however, vandalism graffiti has all but obliterated the fabulous, quality public works of art and has saddened millions of Los Angelinos and visitors. Once tagged, Caltrans has painted over 9 of the 13 murals through the years with gray paint. 4 of the murals have escaped the overpainting by Caltrans. The definitive and actionable planning for this conservation – restoration and maintenance effort was put into action in April of 2011 when The Mural Conservancy of Los Angeles (MCLA) invited FACL, Inc. and Scott M. Haskins, art and mural conservator to meet on the freeways with Caltrans: http://www.fineartconservationlab.com/projects/murals/mural-conservancy-of- los-angeles-meets-with-caltrans-to-inspect-downtown-la-freeway-murals/. 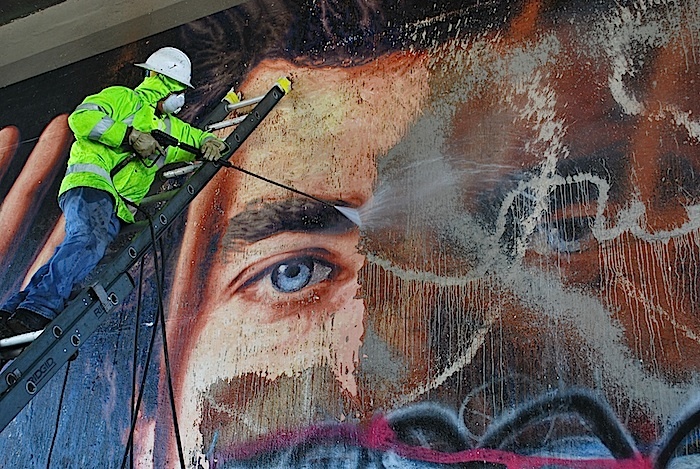 Several graffiti removal processes were evaluated in a subsequent visit in June 2011 to the mural “Jim Morphesis Monument” with Caltrans’ Vincent Moreno and artist, Kent Twitchell. With the “adoption” of Jim Morphesis Monument and the raising of funds for its continued maintenance, graffiti removal tests were done to establish the cleaning and mural restoration processes. Combinations of methodology and materials specifically customized to meet the needs of this particular mural were evaluated with the purpose of discovering the right method to get the job done quickly (a necessary requirement while working on a freeway!) and be able to maintain it easily over time (as the mural gets retagged). The results of FACL’s research and treatments for this mural have been applied by the artist’s of the murals to undertake or direct the conservation-restoration of the other 12 murals… all in all a great step forward in recuperating our city’s lost art monuments. Matt, thanks for leaving your comment. The desire to coat artwork with a protective layer has been a challenge for public art for many decades. There have been a lot of products tried but then they age poorly and are hard to remove after years of exposure to the environment… especially outdoors. The coating you mentioned has proven itself to be a liability and to age poorly. Perhaps it might have “washed off” easily after getting tagged the week or year after applied… put trying to remove it years later… it does not wash off easily. In fact, there a LOTS of conditions that affect the safe removability of a coating: the thickness of the paint of the mural, the number of graffiti layers, the type of graffiti paint, the thickness of the graffiti in relation to the thickness of the original paintings technique, the texture of the wall, whether you can soak the mural or whether you have to be concerned with run-off according to Caltrans environmental laws and concerns… and more. Graffiti Coat is not used by anyone I know. I WORKED ON MANY OUTDOOR MURALS IN LOS ANGELES IN THE 1970’S AND USED “GRAFFITTI COAT” SO THAT ANY PAINT ON TOP COULD BE WASHED OFF EASILY. Wonderful work Scott and team! I have done a great number of murals and have been lucky to have escaped tags. I have varnished mine in the past, but wondered what type of varnish you used on the freeway murals. I’d like to be sure to use the very best. You do such beautiful work. As mentioned in another comment, I really love murals since they add so much life and character to a town. However, I kinda like graffiti too when it’s really well done. I certainly would not support graffiti staying over a mural, but I have always thought that it would be great if people were free to “art up” their communities. Sometimes I fantasize about starting some sort of intentional artists community where that sort of thing is encouraged. As you read and see in the videos on Jim Morphesis Monument, surveillance cameras were installed by Caltrans that are being monitored by city police, CHP and others. That’s one technique to scare them away and to find offenders. Wow! What a restoration! You did a good job. The problem is, how do you prevent people from putting graffiti again on the wall?